Desperate to restart his career, Trego borrowed money from his sister and her husband to fund this last project, the largest canvas he ever painted. He hoped to tap into the ongoing popularity of the famous novel by Lew Wallace, but when the work was exhibited in New York in 1909, it failed to sell or attract attention. Unlike most of Trego’s earlier works, which invite the viewer in for a closer look, this work seems made to be viewed from a distance. 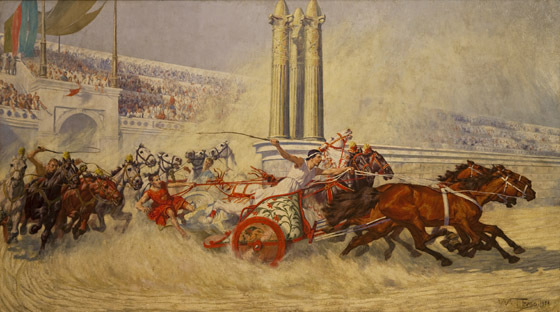 In particular, the prominent figure of Messala falling from his chariot does not bear an up-close inspection as do the figures in other large works such as The Rescue of the Colors. In particular, the faces of both Messala and Ben Hur do not compare favorably with the strong featured faces seen in so many of Trego’s battle scenes or even the faces of Hannah as rendered seven years earlier. Of course, artists often change their styles over the years, and the more painterly approach he took to The Second Goal may reflect a conscious choice on Trego’s part. But like the deterioration of his handwriting in his last years, it may be a sign that the artist’s once-remarkable control of line was being compromised by some further physical illness, perhaps post-polio syndrome. Only months after the painting was returned from New York, Trego committed suicide. The artist gave the painting to his sister, Anna Louise Trego Dever, who conveyed the painting to George School in Bucks County, Pennsylvania, in February 1934. After hanging at George School for decades, it was loaned to the Bucks County Arts Association in 1976. In 1979 George School agreed to a permanent loan of the painting to what was by then called the Bucks County Council on the Arts. The painting was displayed in a number of venues. By 1994 the painting was being stored at the James A. Michener Art Museum, which conveyed it back to George School in February 1995. George School then sent the painting to the Alderfer Auction Galleries, where it was sold as lot 305 on 16 March 1995. By the year 2000, the painting was for sale at an antiques store in Chadds Ford. It was eventually purchased by Thomas Buckley who had it restored and, with his wife, Karen, subsequently donated it to the Michener Art Museum in 2005. New York, 1909: National Academy of Design. In the early 1990s, after the painting had been making the rounds on tour for years, it was in such desperate condition that it sold at Alderfer Auction Galleries for only $300. It was restored and today is in excellent condition.